Thank you to all those anglers who have spent a few moments to summarise their catch in the Cabin Log Book. Only this information forms the basis of our Monthly Report to keep all anglers informed of what has happened. The weather during May has been variable with a number of nights with heavy rain that effected catches. During mid and late May the Carp spawned and the goslings and ducklings grew rapidly. At the end of May the Cats came out of hibernation en masse with both Nigel Gillard and Andrew Moyser joining our “1000lbs Club” – see more details below. Specimens Cats landed this month include 8 x 40’s to 41lbs 10ozs and 80 x 30’s, 2 x 20lbs+ Carp and Tench to 6lbs 14ozs. Visiting on the 1st May, Andy and Ben Perkins landed 4 x Carp using krill boilies. Andy landed Commons weighing 16lbs, 14lbs and 12lbs while Ben had a 14lbs Mirror. Rob Ormond landed 2 x Commons weighing 16lbs and 13lbs on the 3rd May plus a 12lbs Mirror. Regular Dave Kendrick returned on the 5th May and after 40 minutes soon topped the Carp Leader Board with a 23lbs 12ozs Mirror and then went on to add a 16lbs 9ozs Mirror and Commons weighing 14lbs 8ozs and 10lbs 7ozs to his catch. Paul Kendrick (Dave’s son) also landed 4 x Carp including Mirrors weighing 19lbs and 16lbs 4ozs plus Commons weighing 18lbs and 14lbs 8ozs. It was another cold blowy day on the 6th May when Kevin Seal had two successive PB’s landing Commons of 17lbs 8ozs PB and 18lbs PB plus a 9lbs Mirror and regular Reg Miller landed 6 x Commons weighing 17lbs 8ozs, 14lbs 8ozs, 14lbs, 13lbs 12lbs 1oz and 10lbs 4ozs while colleague Steve Harper had a 11lbs Common. Arriving on the 8th May for a 4-day break Tim Lawlor landed 14 x doubles including Commons weighing 19lbs 2ozs, 15lbs 8ozs x 2, 15lbs 4ozs and Mirrors to 13lbs 5ozs plus two smaller Carp. Regular Terry Keard arrived on the 9th May for a 48 hour session and landed 5 x Commons weighing 17lbs 11ozs, 15lbs 6ozs, 12lbs 1oz, 9lbs 1oz and 6lbs 7ozs plus a 17lbs 7ozs Mirror. Terry followed up with another 48 hour session beginning the 23rd May and using Krill boilies landed 5 x Commons weighing 16lbs, 14lbs 12ozs, 9lbs 6ozs, 9lbs 2ozs and 8lbs 5ozs plus a 19lbs 110zs Mirror. Jamie Selby arrived on the 12th May and landed Commons weighing 18lbs 8ozs and 7lbs while colleague Ash Wicks landed Commons weighing 17lbs and 13lbs. Returning on the 17th May, Roger Austen landed 3 x Commons weighing 17lbs 8ozs (on pineapple and coconut boilie), 15lbs 12ozs (on Cell) and 6lbs (on the Sauce) plus a 17lbs 8ozs Mirror (on the Sauce). Paul Lewis visited on the 20th May and landed 3 x Carp weighing 17lbs 8ozs, 16lbs 8ozs and 15lbs 8ozs. Returning on the 22nd May, John Ward landed this Mirror weighing 19lbs 4ozs. Bob Hodder arrived on the 20th May for a short break and on the 22nd landed 3 x Commons including a 23lbs 6ozs PB plus weights of 16lbs 7ozs and 10lbs 4ozs. Regular Jason Tuckey began his 24 hour session on the 22nd May and using boilies plus fake pop-up corn, landed 5 x Commons weighing 18lbs 10ozs, 15lbs 8ozs, 14lbs 3ozs, 12lbs 4ozs and 11lbs plus a 12lbs Mirror. Ian Emms visited on the 25th May and landed a Common weighing 16lbs 9ozs where the successful bait was 18mm Cell boilie. Visiting on the 29th May Simon Rickett landed a Common weighing 18lbs 4ozs plus a 9lbs Mirror. During a wet and windy 1st May Aran Flemming landed Cats weighing 30lbs+, 28lbs and 20lbs. Paul Coombes began his 60 hour session on the 2nd May using prawns for bait and in spite of cold and wet weather had a good session landing a Cat weighing 42lbs 8ozs to top the Cat Leader Board plus 3 x 30’s weighing 31lbs 8ozs, 30lbs 8ozs and 30lbs. In addition Paul landed Cats weighing 21lbs 8ozs, 17lbs 16lbs 8ozs, 15lbs 8ozs and 11lbs 8ozs to round off a 9 x Cat total. On the 5th May John Bairam used halibut pellet to lure a 23lbs 10ozs Cat. Arriving on the 5th May for his 48 hour session Daniel Selby went on to land Cats weighing 28lbs and 17lbs and 33lbs at 6.00 am on the 6th. Bill Ellis had a great session using luncheon meat after arriving on the 7th May for his 24 hour session. With most bites coming during the night Bill landed 6 x Cats including 3 x 30’s weighing 37lbs 4ozs PB, 35lbs 2ozs and 34lbs 4ozs plus others weighing 23lbs, 19lbs 8ozs and 13lbs 8ozs. Jason Tuckey began his 24 hour session on the 8th May using double red pellets bait and although experiencing very few runs, Jason landed a 37lbs 20zs Cat. Arriving on the 8th May for a 4-day break Roy Prout used both luncheon meat and halibut pellet baits and finished with 3 x 30’s including Cats weighing 36lbs 11ozs, 33lbs, 32lbs 7ozs, 28lbs 9ozs, 24lbs 5ozs, 22lbs 4ozs, 21lbs 12ozs, 15lbs 7ozs, 15lbs 2ozs and 14lbs 10ozs. Regular Reg Miller returned on the 13th May and landed Cats weighing 31lbs, a one short of a boilie at 29lbs 15ozs and 25lbs while colleague Wayne Johnson had Cats of 30lbs 7ozs, 30lbs 6ozs, 26lbs and 12lbs. 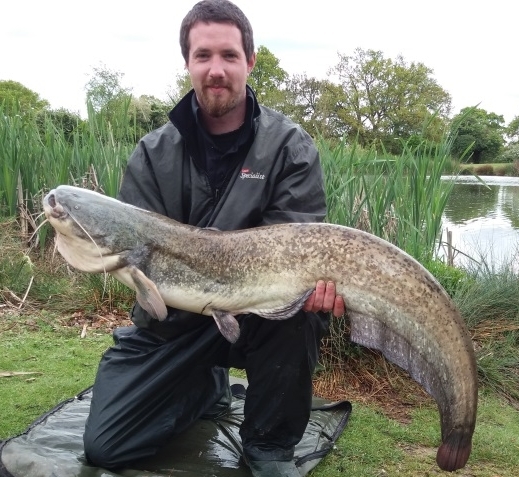 Using halibut pellet bait on the 14th May, Steve Collins landed Cats weighing 23lbs and 19lbs. Arriving on the 15th May for a short break, the “Lee” family plus Lewis Glass targeted the Cats using pineapple and fishy pellet baits and had many successes as can be seen below. Of the 34 Cats landed, Jan led the way with 16 to 30lbs 12ozs while Lewis had the heaviest at 41lbs 4ozs. Regular Paul Hutchinson returned on the 19th May and using crab boilies and halibut pellets found the Cats feeding. His catch included 10 x Cats weighing 30lbs, 24lbs 6ozs, 23lbs 6ozs, 23lbs, 22lbs 2ozs, 22lbs, 19lbs 10ozs, 18lbs 8ozs, 18lbs 2ozs and 14lbs 4ozs. Connor and Alan Cambridge found the Cats still feeding on the 28th May when Connor’s Cats weighed 35lbs 10ozs, 27lbs, 20lbs, 18lbs and 10lbs and Alan’s weighed 37lbs, 29lbs, 25lbs and 19lbs. Regular Reg Miller returned on the 28th May to find the Cats feeding freely and ended up with 10 including weights of 37lbs and 30lbs plus 4 x 20’s while colleague Gary Atkins landed 12 x Cats including weights of 33lbs 10ozs and 31lbs 5ozs plus 4 x 20’s. Arriving on the 28th May for a 36 hour session, regular Pat O’Sullivan found the Cats still feeding freely and had a great catch including 15 x Cats weighing 36lbs, 35lbs, 34lbs, 3 x 32lbs, 28lbs, 3 x 26lbs, 2 x 24lbs, 20lbs, 16lbs and 14lbs. Andy Worf returned on the 10th May and landed 5 x Tench, 2 x Carp plus a Bream. Regular Paul Evans returned on the 13th May and using a pole landed 14 x Bream to 5lbs 11ozs, 2 x Carp to 4lbs 6ozs plus a 2lbs Tench. Returning on the 27th May regular Paul Evans used a long pole and using luncheon meat and sweetcorn baits landed 20+ x Carp to 10lbs, 24 x Tench to a Leader Board topping 6lbs 15ozs, 6 x Bream to 4lbs and 7 x Roach to 1lb. Paul Wharton had a great 4 hour session on the 15th May with a pole catching Tench, Perch and 7 x Carp to 6lbs. Returning on the 26th May Paul landed 15 x Carp weighing from 2lbs to 9lbs plus a 3lbs 2ozs Tench. Feeder fishing with pellet on the 15th May, Fred Little had a mixed catch including Carp, Bream and Tench. Andy Worf returned on the 27th May and using prawn bait landed a 3lbs Bream and Tench plus 2 x Commons weighing 10lbs and 8lbs on sweetcorn. Returning on the 30th May Mark and Sue Rogers had a great mixed haul including a 6lbs 5ozs Common, a 5lbs 15ozs Mirror, 19 x Tench from 1lb 8ozs to 3lbs 8ozs and 7 x Bream to 4lbs 5ozs.